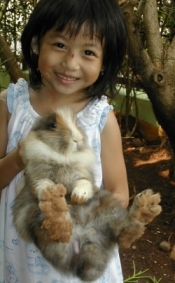 One interesting consideration rabbits as pets is it could help children to manage their emotions by kept them. I had experience myself with my kid, a daughter. My daughter is a cheerful, very active kid – for not to mention hyper-active – but had a bit difficulty to manage her emotions especially when what she wanted couldn’t be fulfilled immediately. Often less tolerant to other, especially to her sister, and parents. Wake-up call just before goes to school routinely becomes morning disaster, hardly to get her to go to the bathroom and be ready for school bus. But that was before she had 4 young pet rabbits. Just within a week or two, her behavior suddenly and drastically changed to more caring and affection to other peoples. It was like a miracle to me… wow !!! Naturally she love animals, many kind of them. Initially she asked to keep for green Brazilian turtles. But what so great about them, we can’t play with them interactively, and they just too quite :) I thought so. Then I bought her 4 young rabbits – white, black, brown and grey – because I owned and liked to play with rabbits when I was a kid, thought it should be fun too for her. Every morning she easily woke up with happy face. First thing to see when backed from school was her loving rabbits. Took care and feed them with great enthusiasms. In short, keep rabbits could be very useful for kids. They can learn to take care of their loving pets that depend on them, and be responsible. Balance emotions and learn to give tolerances to other and to love – pets and humans. And, least important is… rabbits are fun and playful.